EmbeddedXpress (EMX) is a new industry standard form factor for embedded computers that combines COM Express CPU modules with stackable I/O expansion. SBCs offer convenient off-the-shelf solutions but pose challenges for performance enhancement or product migration in an end of life situation. COMs offer performance scalability, wider choice of processors, and easier migration but (until now) require custom baseboard design. By utilizing COM modules in a stackable SBC format, EMX offers the best of both SBCs and COMs without the disadvantages of either. See our line of EmbeddedXpress products to the right! In a typical small form factor system, the processor is fixed, while the I/O modules are interchangeable. With EMX, both processor and I/O modules are interchangeable. EMX offers greater flexibility, scalability, and longevity through the use of interchangeable COM modules. EMX boards are off-the-shelf products requiring no customer hardware development. They offer easy expansion with stackable I/O modules. They provide an easy way to utilize the wide selection of COM Express COM modules available from multiple vendors worldwide, resulting in performance scalability, protection from CPU obsolescence, and earlier access to the latest processor technology. The flexible design of EMX defines two sizes of processor modules: EMX Basic (125mm x 95mm) and EMX Compact (95mm x 95mm). Each size is compatible with all EMX expansion modules. An EMX processor module can be either a two-board combination of carrier plus COM module or a traditional single-board computer. One of the major improvements offered by EMX is the new expansion connector used for add-on I/O modules. The EMX expansion connector is smaller and lower cost than other standards, helping to reduce cost while increasing the PCB area available for processor and I/O circuitry. Thus EMX enables boards with higher feature density than other small form factor standards. The EMX expansion connector includes all the most popular expansion buses utilized by current and planned processors, chipsets, and peripheral chips, ensuring a solid platform for product development. Furthermore it contains ample reserved pins, ensuring a long lifetime for the standard by providing the capacity to incorporate new features as they become available and desirable. The combination of all these benefits provides a compelling reason for embedded computing vendors and customers to utilize EMX as the form factor of choice for new product development. An EMX baseboard is the same size and style as a typical embedded computer board, so it eliminates the need to design a custom baseboard for many applications. A customer can select the COM module that best suits their needs, and match it to the baseboard of choice to get an instant off-the-shelf solution with no custom design. Customers enjoy longer product lifetimes, wider choice of processors, better protection from CPU obsolescence, performance scalability, and earlier access to new CPU technology. An EMX SBC can fit more processor and I/O circuitry on the board without resorting to shortcuts or form factor extensions. Customers can be assured of standard size and shape boards that will fit into their systems without worrying about non-standard board shapes and sizes. The size of EMX Compact is similar to PC/104, providing sufficient room for popular I/O circuits. 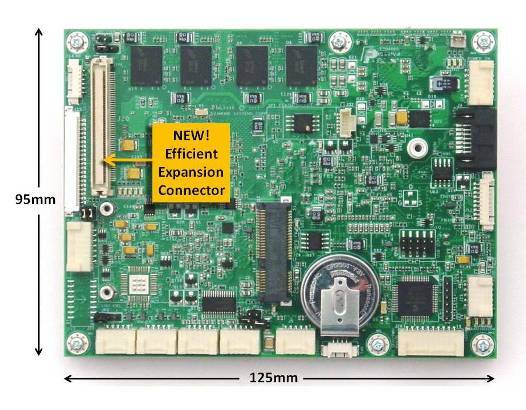 The expansion connector is optimized for size, cost, interconnectivity, PCB area, and PCB coastline, plus it contains sufficient reserved pins for future upgrades. Diamond is committed to designing our products around open standards, providing many benefits for our customers.